Integrated Half Doors: Stay protected from weather and trail debris with standard half doors front and rear. They're built with intuitive latches and great sealing to perform as flawlessly as the rest of the machine. 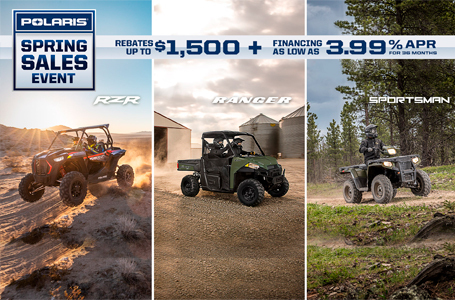 They also swing open wide to make it easy to get in and out of Polaris GENERAL™ 4 all day. Standard Features: The Polaris GENERAL™ 4 Silver Pearl comes standard with a Polaris HD 4500 lb. winch and front bumper to help you dominate the trail and take on the work when you get home. Revolutionary Comfort For Riders Front And Rear: Polaris GENERAL™ comes with all-new seats designed to keep you comfortable no matter where the ride takes you, from ripping trails to a day cutting wood. A wide seat base and supportive bolstering gives a secure cockpit to driver and riders and with standard cut and sewn seats. Driver seat comes standard with a seat slider to dial in operator ergonomics. 48L Of Integrated Storage: Keep work and play essentials close at hand with a combination of in-dash storage and a class-best center console front and rear featuring a 12V outlet and 5.8L storage. 15L included in weather resistant bins under the front seats. Customizable Instrumentation: The digital instrumentation cluster moves with the tilt adjustable steering wheel for maximum visibility. The combination of digital and analog gauge indicates vehicle speed, engine RPMs and standard trip information. The center digital gauge can be set up to just the way you want it, and even features an auto adjusting back-light that can switch from red to blue. Capacity To Dominate: Loaded down with gear for an extreme camping trip or ready to handle the toughest jobs, The Polaris GENERAL™ 4's 1,280 lbs. total payload is up to the task. 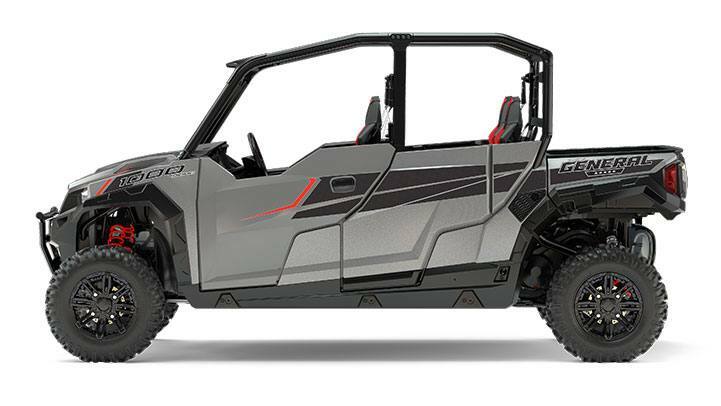 With the standard 2" receiver, The Polaris GENERAL™ 4's 1,500 lbs. towing capacity - aided with standard engine braking - is ready to tackle whatever your day demands. Full Tread. Any Terrain. : As an industry leader in premium off-road accessories for more than a decade, Pro Armor® delivers purpose-built tires with superior durability and ultimate performance for the environment you ride. Not only that, but they’re developed and tested with Polaris Engineers—ensuring the perfect fit and optimal performance mile after mile.